Runner, May-June (when frosts passed). Mangetout/Snap (whole pod eaten), March to June. A legume but is a vetch rather than a pea. 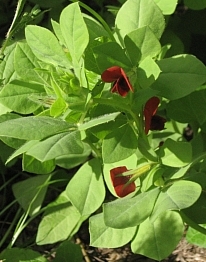 Small attractive dark red flowers followed by winged pods. Will produce attractive ground cover around fruit bushes. Pods need to be picked at about 1" in length or will become very tough. Steam pods for a few minutes. Have a delicate asparagus flavour. Not too fussy but needs to be neutral or mildly alkaline. Should not be heavily waterlogged. Should be neutral or mildly alkaline. Needs a relatively rich soil. Avoid windy areas of garden. Need support, put in before planting. Wigwams work well for french and runner beans. Rows or squares for broad beans with support added as soon as plants reach 18". Broad beans, plant 6"-8" apart, 2" deep. (Autumn planting: 4"-6" apart. There can be heavy losses in a bad winter. If winter is mild, thin in Spring.) French & Runner beans, plant 3" apart, 2" deep. Runners need lots of moisture, French beans less so. Once reached optimum size and pod formation is well underway, pinch out growing tips - this aids growth of pods. Not good germinators in soil, more than 50% seeds can rot. Soaking in water for 12 hours before planting can improve germination rate significantly. Can plant in a shallow trough and slide into soil once plants have reached 2"-3". Need shelter and support. Pea tendrils find it difficult to grip smooth surfaces; rough twine is more effective than plastic pea netting. Keep moist but don't overwater - this will encourage leaf growth at expense of pods. Broad beans: Black fly goes for growing tips as plants mature. Advised to remove soft tops of plants though many say that it makes no difference. Chocolate spot can appear late in the season - do not compost infected plants. If mild outbreak, beans still usable. Broad beans: May-Sept. Early harvested have milder flavour and are less prone to disease. Larger beans may need tough skins removing. French & Runner Beans: June - November. French beans usually a couple of weeks before Runner Beans. Approx. 12 weeks after sowing for main crop. Mangetot/Snap from July to September.